We’ve all heard of and seen outdoor lights. I’m also sure you’ve heard of outdoor security cameras too. On their own, each serves its purpose to either illuminate our pathway – or any other area that doesn’t have roofing – or to assist with keeping watch over our premises, respectively. But a fairly new development are wi-fi light bulb security cameras. – while they’re in, around or away from it. Not only do the crème de la crème of these devices add a greater sense of protection, but they also are usually loaded with fantastic features! For the most part, they can be inserted into already existing lighting fixtures, and don’t require a whole bunch of wiring and hassle to get them up and running. With some brands, installation can be completed in as little as five minutes! It’s important to note that they all require some sort of high-speed internet connection – usually at least 2.4GHz – to operate at their very best. Some are designed to facilitate the use of LAN connection, but even better, many are equipped for quick connection to Wi-Fi. Once they are hooked up, you can pair them with a compatible device to see all the action, get notifications, and even initiate useful commands. The security light and cam duos is best used while mounted on the flat surface of a wall, and at the company’s recommended altitude. Better yet, if they are weatherproof, no serious precaution needs to be taken to ensure that they are protected from any related environmental elements. Home owners are usually serious about securing their investments. Many will even go to great lengths to protect their property – from building fences to subscribing to a monitored home security system. But I find that, no matter their age, tech-savvy home owners are most likely to get the best use out of these products. Many security lights with an embedded camera are crafted to become an easy addition to smart homes; being made for compatibility with smart speaker devices such as the Amazon Alexa. So, they’re best suited for those who are keeping up-to-date with everyday technology trends. Notwithstanding, there are also other factors which could determine who should gravitate to these nifty gadgets. If you live in an area that is poorly lit, and prone to petty theft, this is a good way to spot and even scare intruders away. Also, if you want to keep a better eye on your backyard – then these are also a good option. Many buyers also purchase these products to keep an eye of, and communicate with visitors at their front door without having to get up and run to it – day or night. Important to note, though, if you are a miser on a budget, security lights with cameras may not be the best option for you. The good ones are usually heavily priced, and you may find that getting separate products may be a most cost-effective approach. They are definitely for those who don’t mind splurging a little – especially if they’d like to purchase more than one! 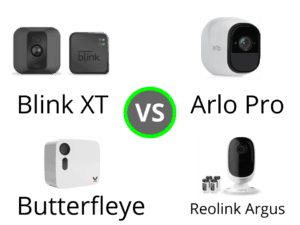 As with any piece of technology, there are pros and cons, associated with many security lights and camera combos, that you should consider. More stylish and less obvious option than mainstream security cameras. Easy to install – both hardware and software. Great addition to smart homes – since they are compatible with portable and smart devices. Can heighten safety after dark with motion detection – which triggers lights to turn on automatically – especially if your hands are full. Motion detection lighting can help you save money. Allows you to communicate with visitors or scare away intruders from a distance (with a built-in speaker and/or siren). Great cameras – high HD resolution (720p and up) and wide viewing angles. Many are equipped with night vision technology. LED lights can be just as bright as other home outdoor lights. Can be battery and/or solar powered. Not a foolproof way to stop theft – since the system is not professionally monitored. Some brands can be expensive for what they’re worth. Most brands require subscription to a cloud service to store recordings – without them you can only benefit from live view video. Most brands offer limited colors and styles. Batteries may need to be replaced regularly if the model isn’t energy-efficient. May have frequent false alarms. Poor internet quality will hinder performance. 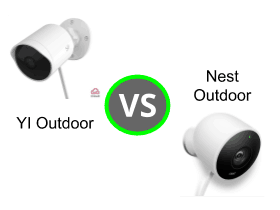 When deciding on an outdoor home security light with camera to purchase, you must definitely think about what you’d like to get out of it. To conclude, here’s a list of all the features for your future device needs to have to get the best bang for your buck! High camera resolution – The camera resolution determines how pixelated a video is, and the higher the resolution, the better. A camera quality of at least 720p is recommended. Night vision capabilities – Let’s face it. You won’t only be using your camera in the daytime. Night vision allows for better video clarity in the dark. This way, you won’t miss out on too much action after dark. Weatherproof – Since the equipment will be used outdoors, it’s imperative to ensure that it can sustain all the dust, rain, snow and other ecological elements that are bound to come its way. A weatherproof system will surely lengthen the life of your device. Motion Detection System –A motion sensor recognizes movement on your premises. It goeswithout saying, that without this feature, you may not be able to program your device to trigger an alarm at unusual activity, send notifications to your mobile device, or to automatically turn your lights on. Smart Speaker Integration – Most tech-savvy home owners are going with the trend of turning their homes into smarthomes. Ensuring that your security light camera is compatible with smart speakers, like Alexa or Google Home, will make it much easier to send commands (such as activating the siren or turning on the light). Efficient power source – Having an economical power source such as built-in batteries or solar-powered rechargeable batteries eliminates the headache of high maintenance. You want your device to be powered by a source that will allow it to be on for as long as possible. That way, you won’t miss out on anything important. Powerful LED – Last, but certainly not least, an LED light that is anything less than powerful would defeat the purpose of having an outdoor security light with a camera to begin with. When selecting a device, it’s a good idea to ensure that the light has at least 700 lumens to provide ample outdoor illumination. Weighing just a little under three pounds, the Sengled Smart LED Floodlight and security camera combo is perfectly designed for use outdoors. Available in only white, the light is equipped with night vision, and is armed against precipitation. The floodlight resembles the typical PAR38 bulb, with a few exceptions. Instead of the complete prismatic hard glass lens covering the entire front section, it is limited to the just the center of the bulb. The front section is also decorated with two smaller lights, a two-way audio speaker and a 1080p security camera’ while on the opposite end, there is the E26 base – all of which makes for an attractive, compact design. Genius Features This 2nd generation outdoor security light with camera is entirely wireless, which means that no drilling or cabling is necessary for installation. The base allows the light to be effortlessly fitted into an existing lighting fixture. Plus, its external antenna makes connecting to WI-FI, from a distance, a total breeze. Additionally, it easily switches between night vision to full color HD video to facilitate an exceptionally clear view after dark. Its PIR sensor accurately identifies passers-by and responds by capturing a video, turning on its LED light, and forewarning the app owner with a notification. Owners can opt to settle for the complimentary 24-hour video cloud storage which excludes motion zone or person detection. They can also choose to upgrade their video storage to two, seven or even 30 days with the added features. Also included in the package, is a bonus single head lighting fixture which can come in handy for adjusting viewing angles. Unlike the regular old PAR38 bulbs, Sengled’s Smart LED floodlight uses its built-in camera to heighten security. Its camera possesses a 140 degrees wide angle which allows users to view a great deal within the camera range. The Verdict The Sengled Smart LED Floodlight with Security Camera is perfect for homeowners who would appreciate a discreet addition to their security system without all the hard work. The Ring Floodlight Camera is jam-packed with a ton of goodies for those obsessed with home security. This nifty product has a HD security camera with built-in a motion detector, a siren and a two-way talk feature. With all the rage about smart homes, it’s hard to not to get excited about the fact that this product pairs well with Amazon’s Alexa. What It Looks Like Ring offers this sleek floodlight camera in both white and black which gives you the opportunity of better blending it in with the aesthetics of your home. There are two separate lights which together are 1800 lumens – which is pretty bright! Then, the security camera is embedded – quite obviously – between and beneath the two lights. All of this is smartly perched upon a mounting base which allows for greater flexibility in adjusting both the lights and camera. What’s On the Inside One downside, though, is that the product is not wireless, and requires a hardwire installation. Another disadvantage is that it is not weatherproof on its own, and needs to be installed in a 4-inch round weatherproof electrical box. In this day and age, who has time for that? On the bright side, you can use your voice to activate the video by sending a command to Alexa. You can also use your digital devices – such as phones, tablets and PC – to not only see and hear what’s going on, but to let those on the other end know that you know what’s going on. This is perfect for scaring off intruders, or simply sending a friendly ‘hello’ to loved ones – from just about anywhere – once you’re connected to the net of course! The motion detector is powerful enough to recognize humans – and similarly sized items – from as far as 30 feet away. And this when it’s already been anchored 9 feet off the ground! Users can access a live view video in crystal clear 1080p and infrared night vision. They can also choose to add a Ring Protect Plus or Ring Protect Basic plan to store, review and send their videos. As a higher budget outdoor light and camera duo, it truly serves its purpose. It keeps your premises well lit, and gives the added security of deterring unwelcomed visitors through its video and voice features. 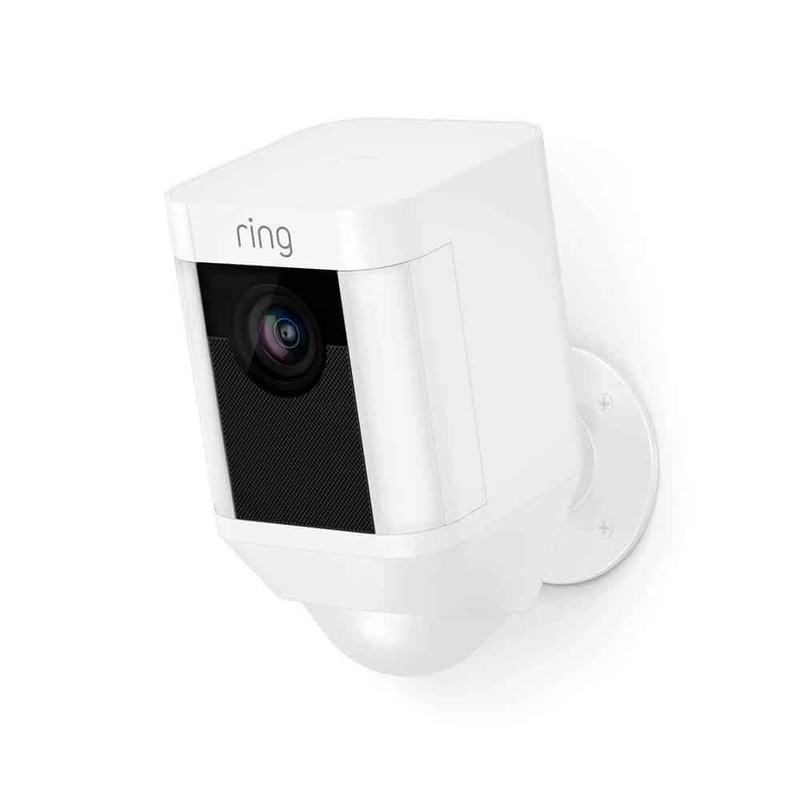 The Ring Floodlight camera is a definite YES for the more modern homeowner who doesn’t mind letting everyone know that their home is armed and protected. Interested in adding a layer of protection to your DIY smart home without all the extra fuss? The Ring Spotlight Cam Battery is the perfect choice to do just that! It has a two-way talk feature, a siren, and connects easily to Amazon’s Alexa – all while running on a rechargeable battery pack. Isn’t that simply amazing? The Visual Appeal The product is available in both black and white, and presents itself in a neat, little package. For the most part, the unit has a rectangular shape which cleverly houses a camera, a speaker, and a battery pack. On either side of the unit, there are LED light strips which brandish a luminous white. The unit is designed on a mounting base which provides some adjustability. Internal Elements Ring made the absolutely outstanding choice of giving this spotlight cam a completely wireless design. It allows for ease of installation which means users can have it up and running within five to 10 minutes. Plus, the battery pack can be quickly removed, recharged, and reset without any hiccups. A total timesaver! To make matters even better, it can get even more wireless! The device can accommodate an additional battery pack, and a solar panel can even be connected to extend battery life. Similar to its counterpart – the Ring Floodlight Camera – it is enabled for use with Alexa. This is great since you can trigger real-time video without lifting a finger. It also gives users the ability to see all the action from the comfort of their Android, iOS, Windows 10, and Mac devices. The two-way speaker, customizable motion sensor, and siren can help you to sabotage criminal activity without getting too close. What a treat! 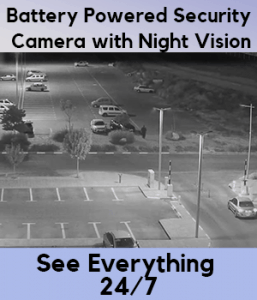 The video camera allows you to see clearly both day and night with the help of 1080 pixels and infrared night vision. If you’d like to save, review and share your videos, you can also add either the Ring Protect Plus or Ring Protect Basic plan. This tiny security solution provides just what techy home owners on a budget need. Its LED light ensures the right amount of visibility at night, and its camera allows for an increased sense of security. With its low cost, easy setup and sensible design, the Ring Spotlight Cam Battery is best suited to homeowners who would like to add just the right amount of security – with just the right amount of discreteness – in a practical way. If you don’t like to have a slew of selections whenever you’re shopping, now’s your chance to navigate to another one of my reviews. The Maximus Video Security Camera and Outdoor Light comes in several forms. The styles available are: Contemporary, Traditional, Craftsman and Coach. Depending on the style, you can choose between the colors black or bronze. On The Outside At first glance, this camera appears to be just another outdoor wall light. Whatever the style you choose, you’ll receive a mounting base with a glass shade in top center position. The included LED bulb combines with the shade to create a mellow glow. In the middle of the mounting base, is the two-way intercom. Just below the intercom and the shade, the camera sneakily tucks itself away – making itself hardly noticeable by those unsuspecting. On the inside, like a number of outdoor security cams, this is completely compatible with Amazon’s Alexa devices, which means that once the devices are paired, you can use Alexa to, for instance, manipulate the light. The two-way intercom allows you communicate with those on the other end. Plus, the siren rings out at 100 decibels, so it should be fun scaring trespassers out of their wits. One heart-breaking fact, though, is that the camera has only 720 pixels, while similar products in the same price range are offering 1080 pixels. Also, while the video is clear enough during the daytime, it’s lack of night vision renders the camera almost useless in the dark. That aside… the cam is also endowed with smart motion detection capabilities. We’re not just talking about any motion detection system. We’re talking about a smart system. The camera can be programmed to sense your usual folk – like a spouse. But it will ignore a dog passing by or recognize that a delivery man is at the door. As time progresses, its ability to differentiate objects will only get stronger. It facilitates live view, notifications, and cloud recordings all from your mobile device. Kuna’s cloud plans allow users to view, and download recorded videos. Installation is easy and can be completed in 15 minutes; and though it is battery powered, there’s no need to change or recharge the battery. Conclusion The Maximus Video Security Camera & Outdoor Light is a clever and practical way to keep up with the goings-on on your residential premises during daylight hours. Its fancy display will definitely enhance the look of the present-day home. If you have dedicated personnel to monitor your premises at night, I’d say go for it! But if not, it’s lower quality video, and lack of night vision makes it a deal breaker. You’re better off purchasing a fancy outdoor wall light if that’s what interests you most. Just a little over one pound, the SENS8 Outdoor Camera with Light is a tiny gem packed with a wide array of features. We’re talking about Motion Detection, Two-Way Audio, Night Vision and the works! What You See Available in white, this outdoor security camera and light twosome shows off an elegant, oblong shape on a built-in mounting base. At the top, there is an 800 lumen LED light which shines as bright as 800 candles lit altogether. Beneath the light, there is a 1080p camera which can view up to 140 degrees wide and is fully equipped with HD live view and night vision technology. Following the camera, is a black, spherical PIR motion detection sensor. What You Get Inside The brightness of the LED light can be set to one of three modes: Motion Triggered, Dawn to Dusk, or Always On. The light, along with a 95 decibel siren, is pre-programmed to turn on automatically once triggered by motion. To lessen the frequency of false alarms, users can customize motion detection to focus only on problematic zones, and insignificant environmental elements. The product requires a Wi-Fi frequency of at least 2.4GHz and power socket to function optimally. As a plus, a 20ft power cord is included in the package. SENS8 ensured that this gem is fully protected against dust, rain and even snow with IP66 rated technology. Unlike most security cam and light combos, this product ensures that users have complete privacy. There are no cloud subscription fees. The product is compatible with Dropbox and Google Drive. 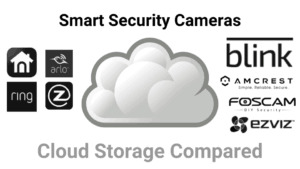 So you can record, store and view as much as those platforms will allow you to – without having to feel as if you, your household and your home are always in view of a bunch of top-secret, all-knowing eyes. To top it off, the device can be connected to and controlled by your Amazon Alexa devices. SENS8’s Outdoor Camera with Light doesn’t sacrifice style to offer a practical, and effective home security solution. It not only helps users see better as they move around outside at night, but also gives them a better view of the outside while they’re inside or completely away from their property. This beauty is best suited for homeowners who want it all – in a neat, little package. The SOLLA Security Floodlight is a massive home security system with two-way talk speakers, a siren, and an all weather proof design. At almost three pounds, it is a dramatic addition to home outdoor security and lighting systems. First Glance What would you do if you saw a monstrous troll sitting atop a bridge you wanted to cross? At first glance, this product has the same effect a scarecrow would have on a flight of birds that wanted to swoop down on a field of seeds and crops. Fastened to the top of a circular base, is a pair of large floodlights which could easily be mistaken for miniature horn midrange speakers while looking at them head-on. The actual speaker, though, sits simply beneath and between the lights. Then, below the speaker, the camera is housed on the third prong affixed to the base. The product is only available in white, matte finish, and in this style. A Deeper Look Is SOLLA’s Security Floodlight just big for nothing? In 720p video, you can keep up-to-date with what’s happening on your premises with high definition live view. It must be connected to at least a 2.4 GHz Wi-Fi or a LAN cable to function effectively. The viewing angle is up to 120 degrees wide, and recordings can only be stored on a Micro SD card not exceeding 64 gigabytes. Its speakers make it possible to hear what’s going on from a distance, and for others to hear you, using your Android or iOS device. They also facilitate a siren which rings at up to 90 decibels. The motion detector is supersensitive, and is triggered despite the kind of object which passes by at night. The 26 watts LED floodlight works alongside the motion detection system to ward of potential intruders, and does not remain on for prolonged use. However, it is weather proof and can fight against rain, snow and even sleet. The product can be mounted as far as 32 feet off the ground, and this requires hardwired installation using a junction box. Final Impression Page 6 of 6 The SOLLA 26W LED Security Floodlight Built-in HD WiFi Camera is a gargantuan device that doesn’t offer as much as its competitors – many of which are much smaller in comparison. It functions wells as an outdoor light, but it may just be big for nothing after all. Whether you’re a traditional or modern homeowner, take my advice and stay clear of this supposed home security solution. 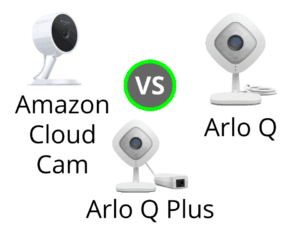 Arlo Pro 2 vs Nest Indoor Cam vs Amazon Cloud Cam- Can Anyone Stop the Amazon Juggernaut?